A “Class of 1963” charter inductee, “Iron Mike” Karakas grew up as a baseball battery mate with another Reds Hall of Famer, Frank Brimsek. He was the first American-born goalie to star in the NHL. Mike compiled a 110-132-28 record and a 3.66 GAA in 270 games played over 5 seasons with the Reds from 1939-1944 and 1946-1947, backstopping the Reds to their Calder Cup championship in the 1939-1940 campaign. 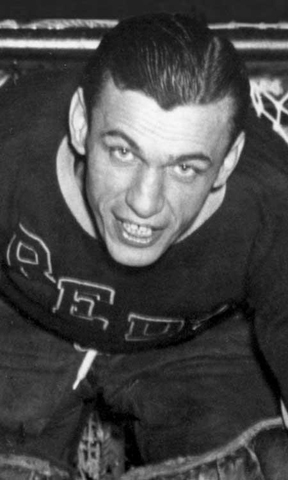 During his six-year NHL career from 1935-1940, Karakas’ brilliance was reflected in a sparkling 2.92 GAA and a 114-169-53 record in 336 games. He won the league’s rookie of the year Calder Trophy in 1936 and the led the Chicago Blackhawks to the Stanley Cup the following year. Ten years after is Reds Hall of Fame induction, he was further honored with enshrinement as a charter member into the United States Hockey Hall of Fame.